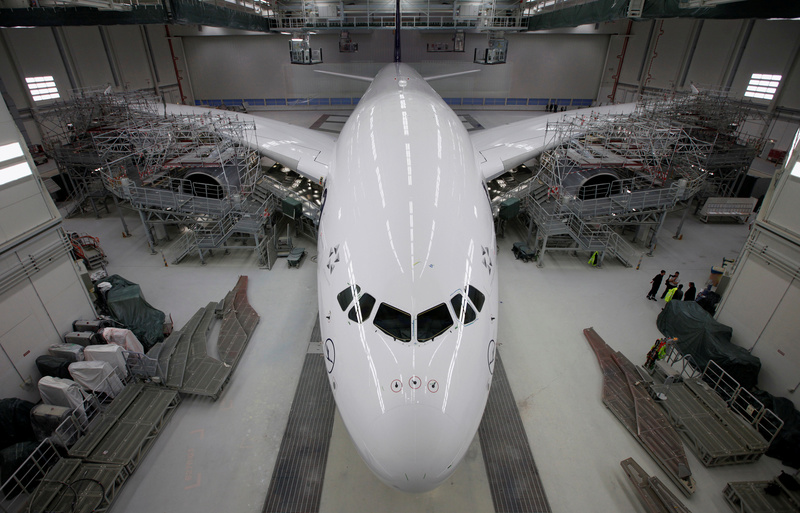 A new Airbus A380 airliner for Lufthansa is ready to leave the paintshop hangar at the Airbus facility in Finkenwerder near Hamburg, Germany, February 5, 2010. Airbus said on Feb. 14 that it was scrapping production of the A380 superjumbo, the world’s largest airliner. The decision came after Emirates, the largest A380 customer, decided to reduce its orders of the superjumbo and instead order a total of 70 of the smaller A350 and A330neo models. Airbus also reported fourth-quarter adjusted operating profit of 3.1 billion euros ($3.5 billion), up 56 percent from a year earlier and higher than analysts’ expectations of 2.92 billion euros. Airbus shares rose 5.3 percent to 109.97 euros by 0802 GMT on Feb. 14, approaching the record high of 111.16 euros hit on July 26, 2018.